Perhaps now more than ever, the world of healthcare is ever-changing. Issues related to medical technology–such as x-ray compliance or cybersecurity–are no exception. These dynamic areas are crucial to navigate, for the safety of medical practices and patients. Regulating the operation of x-ray machines and other radiation-emitting technology is a preventative action. Unchecked machines put both patients and technicians at risk for overexposure to radiation, and increase the margin for misdiagnosis. Cybersecurity is crucial for patient confidentiality and safety. Go right to the source! The homepage for the US Department of Health and Human Services provides pertinent and current healthcare information. With a search bar function at the top of the page, it’s easy to find a quick answer to a lingering question. Or, to learn about specific laws, click the Laws & Regulations icon. Here, find material on topics like the Affordable Care Act, or the HITECH (Health Information Technology) Act. For an inside look at current proposals and changes, this page also provides a link to the semi-annual Regulatory Agenda from the HHS Department. “Stop. Think. Connect.” The motto of StaySafeOnline.org is relevant for healthcare technology, because of the increasing prevalence of medical identity theft. If patient medical records and health insurance details are not protected, hackers can use the information to access prescriptions, doctor visits, or file insurance claims. Stay Safe Online has countless blog posts and external resources for protecting medical computer systems. Learn how to implement a cybersecurity plan! Their Stop Think Connect Campaign website also gives quick tips for keeping a clean and safe internet presence. The official government website dedicated to Health Information Technology has a great deal to say regarding EHRs, or Electronic Health Records. They advocate strongly for this method instead of paper records, for the sake of patient security. Their home page has search tabs curated for the specific user, such as, “Patients & Families,” or “Providers & Professionals.” Countless resources for a more secure practice! The Health IT Security Risk Assessment Tool is a downloadable application created to assess cybersecurity. There are also paper-based versions of the same tool available for download, which are formatted as lists of questions to thoroughly address every aspect of security. Explore these resources to help ensure the safety of your practice and patients. 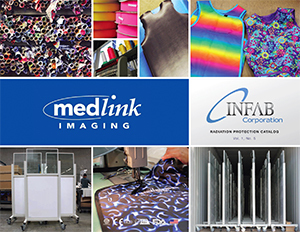 Medlink will stand with you and give you peace of mind that your systems are up to date and maintained properly. Learn more by calling 800-456-7800 with any questions about x-ray equipment or compliance.